Well, it’s not Hallowe’en, but there seems to be a monster theme going at the Book Chook lately. Recently, I told you about the Sock Monster. Last year we had Moody Monster Manor and Apps and Activities for Hallowe’en. Next month, I'll review The Daily Monster Monster Maker app! And now here’s another monster-based app. 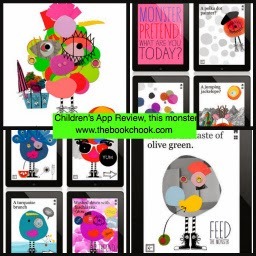 It’s a totally gorgeous app for kids: this monster - creatures that love color. It zings with colour, texture and creativity. Color-Eating Monsters, a Polka-dot Painter, a Musical Mermaid and a Jumping Jackelope…a sweet digital tale which will amuse and delight. This monster uses hand-crafted, colorful materials in combination with original music and sound effects to tell a sweet, charming, interactive short story about color-eating monsters. Created with paper, fabric, and pen, the artwork in this monster has been lovingly created for a color-laden, tactile experience, that you and your child will love. + As a bonus: Make a polka dot painting, dress a monster! I love the way the app’s art work emphasises the handmade. Kids will recognise this instantly and I hope they’ll go on to design their own little monsters with scraps of fabric, feathers, card and whatever else they can find. There are also opportunities to play in the app - after reading and interacting with the story, children are encouraged to play with polka dots and dress a monster for themselves. You can see my colour monster top left in the collage above - created in app and then saved to the camera roll. The music is great - I very much appreciate developers who consider the fact that adults may have to listen to a tune over and over. And over! This music also suits the liveliness and fun of the app very well. Check it for yourself via the video embedded below, or visit the this monster website. Check out my other iPad App Reviews on Pinterest. You can see all my reviews from 2013 here.